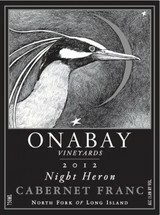 Cabernet Franc Night Heron is produced from the best selections from Onabay's four blocks of Cabernet Franc. One block planted exclusively to a Massale selection from Pomerol via Napa Valley and most recently Schneider's former Roanoke Point Vineyard. Yields are less than two tons per-acre which result in great concentration and elegance, approachable in its youth but possessing great aging potential. The 2012 Night Heron Cabernet Franc also has 3% Cabernet Sauvignon and 1% Petit Verdot. It was aged for 17 months in French oak (40% new, the rest two to three years old) and comes in at 13.8% alcohol. It is revisited this issue for a checkup. It seems a bit more evolved and expressive in a relatively short time, plus more complex. At my last tasting, the Cab Franc character did not start strong, but as noted then, some herbaceous hints began to pop up in time. This is closer to the 2010 now as the fruit's character continues to emerge and becomes more obvious from the get-go. The herbaceous hints are well controlled, though, and the little touches of olive in the background merely announce the grape. Overall, this is still showing beautifully, combining the vigor of the 2013 Cot-Fermented reviewed this issue with the character of the 2010 Night Heron. It has become impressive enough that I'm looking forward to seeing the 2013. Note, too, that it still has some capacity to improve--it kept getting better for the hour or so that I had it in a glass.